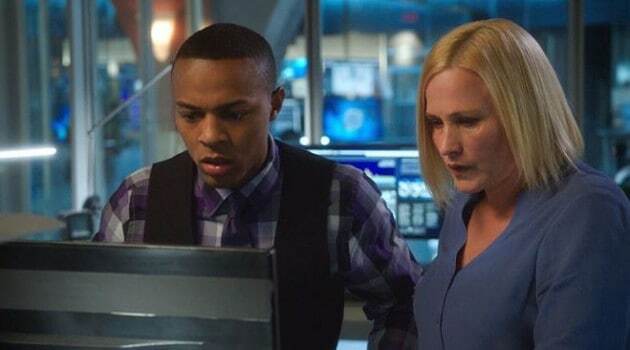 CSI: Cyber Season 1 Episode 12 & 13 Review: "Bit by Bit"/"Family Secrets"
In this first episode of the two-hour first season finale of CSI: Cyber, the team goes up against a bitcoin thief and bounty hunters, hired by a jealous brother trying to get back into his parent’s good graces, who attempt to steal from said thief in “Bit by Bit.” We first see a confusing opening scene as a panicking Agent Krumitz runs into an unknown house, up the stairs, and into a room. He then does something on the computer and runs right back downstairs, only to bump into Agent Ryan, who tells him to stop and to come stand with her and his brother as he is about to reach for his gun. We then see a gun trained on Agent Krumitz just out of the frame as Agent Krumitz goes to stand beside Agent Ryan and the unidentified boy. Flashing back thirty-six hours, the entire downtown area of Detroit has blacked out, causing people to break into stores and start looting. The blackout turns out to be a cover-up for a bitcoin heist (bitcoins are a form of online currency that’s used on the Deep Web and is worth real money when converted) as a hooded thief leaves the vault of Silver Clasp jewellery store, taking half a million dollars worth of bitcoin from the owners’ laptop, which was locked inside the vault, and killing an innocent man in the process. The team then tracks down the thief who took the bitcoins to a hotel room where they find the thief tortured and killed. Other interested parties had wanted the passkeys to access the bitcoin account from the thief, but the he wasn’t able to give said passkeys so the interested parties had to nip the bud. It was later revealed later in the episode that the jewelry owners’ oldest son had hired two bounty hunters to help him get his parents’ bitcoins back, but his ingenious plan backfired as the bounty hunters (who are also brothers) turned on the brother, Stephen Christos (guest star Brandon Barash), and went to get the two passkeys from two different people’s computers using botnet, a network of private computers that are infected with malicious software (like a virus) and controlled as a group without the owner’s knowledge. The first passkey is retrieved from an Oklahoma businessman’s laptop and the second passkey is on the Schaeffer family’s home computer. Just as the latter is about to be retrieved, the FBI intervenes by uploading a fake passkey as bait. That’s when we see the continuation of the opening scene with Agent Krumitz running toward the Schaeffer’s house in order to reconnect to the Internet so that the fake passkey can be uploaded, but he is intercepted by Agent Ryan and the Schaeffer’s son Jeffrey (guest star William McMullen) when she sees the latter trying to get into the house to retrieve a video game while Agent Krumitz was inside the house. She then tries to pass herself and Agent Krumitz as Jeffery’s mother and brother, respectively, but it backfires as one of the bounty hunter brothers had seen pictures of the Schaeffers. It looks like the end for the three of them, but it’s not thanks to Agent Krumitz’s quick thinking in taking down one of the bounty hunter brothers and shooting the other one in the shoulder, before Agent Mundo storms in with the SWAT team. The stolen bitcoins are then returned to Mr. and Mrs. Christos, and Mr. Christo (guest star Tony Amendola, seen on The Mentalist and CSI: NY) decides to cash out the bitcoins and sell the jewelry store because it’s time to retire for real. Stephen also patches things up with his family, and all is right in the world. It was great to see Nelson get all of his devices back and that touching scene with him and Agent Ryan singing along to a song that was a favorite of Mrs. Nelson’s. I also enjoyed the whole “Daniel Krumitz, coming through!” scene as Agent Krumitz re-lived his awesome take down moment. 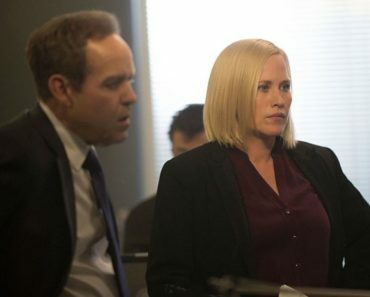 Things then took a dramatic turn in “Family Secrets” as the person who hacked into Agent Ryan’s computer when she was still a behavioral psychologist in New York comes back to even the score. In the opening scene, we see Brody Nelson on a rooftop of a building across from Agent Ryan’s apartment, and he downloads something from Agent Ryan’s laptop with a virtual file extraction gun. He then takes out his phone and calls Raven, telling her that he’s sending her a file and to not open it. A mysterious figure then comes out of nowhere and knocks Nelson unconscious. The scene then shifts to a diner, where Agent Krumitz and his sister Francine (guest star Angela Trimbur) are laughing hysterically at a childhood memory. Their happy moment is cut short when Agent Krumitz sees the reflection of the person responsible for the death of their parents, Taylor Pettis (guest star Deron Paul), sitting in a booth, eating breakfast. Agent Krumitz then stands and goes over to Taylor’s booth to talk to him and has some choice words for the man that took his and Francine’s parents away from them, which lands him in hot water with Assistant Deputy Director Sifter after he hears that Krumitz had used his FBI authority to threaten Taylor Pettis. The team then catches a case in which nine people were hacked and their private conversations during a therapy session were made public, much like what happened to Agent Ryan in the past. The team tracks down the source of the conversations to the office of psychiatrist Dr. Richard Chan, only to find the good doctor dead when the team arrives at Dr. Chan’s office. A print is lifted from a piece of glass from a broken hourglass and a match is found. The owner of the print turns out to be Agent Ryan, but she has been nowhere near Dr. Chan’s office. How could someone get her prints and then put them on the same hourglass that Agent Ryan used to have in her office back in her behavioral psychologist days? 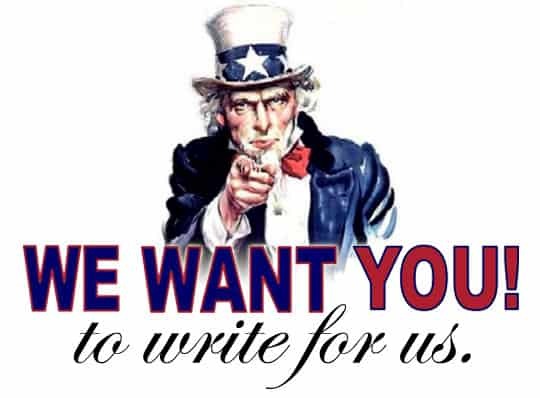 It seems that someone is trying to get Agent Ryan’s attention, and it’s working. Meanwhile, Raven gets worried when Nelson doesn’t show up for work. She lies to Agent Ryan to cover for him, thinking that he’s just running late, but after a while, there’s still no sign of Nelson. Raven then uses a location trace on Nelson’s phone and finds him tied to a pipe on a rooftop. She tries asking him what was going on after cutting him free, but all Nelson says is if she got the file he sent her and that he needs to speak with Agent Ryan. Back at the office, Agent Ryan is shocked to see an injured Nelson come into her office asking if he can speak with her privately. 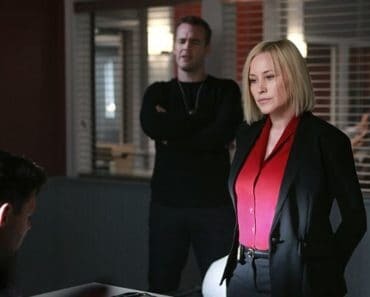 Nelson then tells Agent Ryan that someone, using him, has been spying on her and the reason to why Nelson has been spying on Agent Ryan is that he was trying to help her catch the person who stole all of her patient files by doing some digging on the Deep Web, which, in turn, violates the terms of his parole. Nelson doesn’t care about that, however, as he tells Agent Ryan how he found the RAT and shows her the USB flash drive that contained the malicious software. The two then go into the lab to see what the code looks like as Agent Krumitz rambles on and on about his own findings with regards to the case at hand. The latter then sees the code for the hack as the same one that was found on Dr. Chan’s computer, to which Agent Ryan deduces that it’s the same Black Hat hacker that had hacked her. So the hunt for the hacker begins. Later that night, as Agent Ryan stays home, a virus attack is launched on the Cyber Division Turns out that Agent Ryan had decided to take matters into her own hands to track down the hacker herself. She plugs in the red USB into the laptop given to her by Agent Krumitz and speaks to the hacker, who watches her from an unknown location. The hacker says via text that he wants to meet Agent Ryan in person and sends her instructions as to the location of their meeting, a locker number (and combination) located at a bus terminal at Sparrow Point. When Agent Ryan opens the locker, she finds a webcam and a phone that’s been glued to the locker. She flips open the phone and sees a text message telling her to leave her weapon in the locker. After doing so, the hacker sends another text message, which tells Agent Ryan to go to 4826 Riverside Drive. Back in D.C., the rest of the team finds the hacker’s address, but when Agent Mundo and SWAT go to Hanover, Connecticut, they don’t find the hacker but, shockingly, Agent Ryan’s ex-husband Andrew Michaels (guest star Brent Sexton). Not only did Agent Mundo not know she was married; we didn’t either. Speaking of Agent Ryan, she arrives at 4826 Riverside Drive and discovers it to be a warehouse of some kind. She then comes across a room in the warehouse that is set up like her old psychologist office in New York. Agent Ryan then puts all the pieces together as she confronts her hacker, a former patient named Logan Reeves. It seems that Logan feels that Agent Ryan abandoned him when she could’ve helped him, but that wasn’t the case, according to Agent Ryan. Logan is also the one who killed Danielle and not her abusive ex-husband. How’s that for a shocker? Logan then tries to kill Agent Ryan with carbon monoxide poisoning, but Agent Ryan knocks him unconscious and uses Logan’s phone to call Agent Mundo to tell him to come to her location. Agent Ryan then faints from the carbon monoxide before she can give Agent Mundo the complete address. The team manages to find the warehouse, saves Agent Ryan, and arrests Logan Reeves. At the end of the episode, we see Assistant Deputy Director Sifter get called to a crime scene, which is a first, given that Sifter is almost always at the office and never out on the field. It seems that Taylor Pettis has been killed, but it is unclear who the killer is. We then see Agent Krumitz running in the rain towards a waiting car. He gets in to see his sister Francine crying buckets of tears as she tearfully tells her brother that she killed Pettis and shows him the gun that was used to shoot Pettis as the scene fades to black. 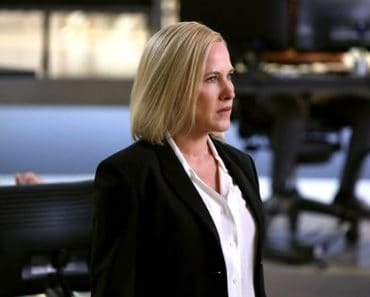 This first season of CSI: Cyber was quite the roller-coaster ride, and I’m looking forward to seeing what Season 2 has in store when D.B. Russell joins the team in the fall. I’m also going to miss seeing Peter MacNicol as Assistant Deputy Director Simon Sifter as he is leaving the show as Season 1 wraps. I enjoyed the scene where Agent Krumitz offered to stay and keep Agent Ryan company, but then thought it would be awkward and left. It was also nice to hear Agent Ryan call Agent Krumitz by his nickname rather than his real name. What did you think of this first season finale? Would you tune in to watch season 2? Will you miss Peter MacNicol as he exits CSI: Cyber? This show is just spectacular! I recommend it to everyone I know because it’s super interesting, utilizes real-world technology, and the episodes focus on real things that real cyber criminals are actually doing in the world. That being said, one major flaw in the show’s formula that MUST be fixed for season 2 is humanizing the villains more. As it is, they seem far too 1-dimensional and don’t seem like real people because hardly any of them have any backstory (or even get a chance to speak). When you don’t do that, the viewers watching can’t identify with the villains so the viewers don’t see what they could become. By far, the best episode of the season in that regard is the one where the heartbroken father goes insane and starts killing Zogo passengers because one of the drivers of that service ran over his son and fled the country to avoid manslaughter charges. The villain in that episode worked because he was someone real and identifiable. As Mundo said later in the episode, “If anyone ever hurt [my daughter] Michelle… I don’t know. I might become Richard Davis. (the murderer)” And it only worked because they gave him his moment to show how he felt. When Avery talked him down and convinced him to willingly drop his gun, she could tell he wasn’t a bad man, just a man that had gone down the wrong path. THAT’S WHAT EVERY VILLAIN NEEDS. They need a backstory, and they need to show actual emotion. Otherwise you might as well be arresting cardboard cutouts on the show. I completely agree! Of all the CSI series that I have watched over the years, every villain has been given some sort of back story so that we as viewers can understand why they have chosen a life of crime. It makes us want to either hate the villain for committing the crime or sympathize with them because they only did what they did to avenge a lost loved one. 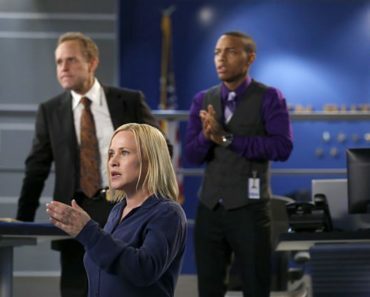 Mostly CSI Cyber plot errors are things that are not too glaring. Fortunately this episodes mega-clunker is in side plot at end of finale not in main action. Get a new lawyer for appeal if this hits you in court. Plus ask for judicial review if judge violates discovery rules like this one did. Sister following 30 seconds behind? ROFLMAO Cell phones pings are more like 15 minutes apart to conserve battery. Nor do they ping at the same time within a 15 minute intervals except by pure chance. Your cell might ping to last tower just before entering new tower area – so almost a full ping interval delay could be involved in position by cell tower. OK lets assume both stalker and stalkee had active phone calls going the whole time just for argument. Still some problems. Cell signal strength varies based on exact line of sight to tower (walls of surround buildings etc). So you might still home to old tower longer if you walk on other side of street. 30 seconds is not a lot of distance covered if walking slowly. That theoretical triangulation accuracy that a cell phone company quotes is only is only true for unobstructed LOS and makes some assumptions about the cell phone transmitting power which can vary some based on antenna orientation, battery levels, transmitter design etc (only some reported to tower by phone) . And triangulation accuracy varies a lot by carrier. Now the 30 second following evidence might be creditable IF both people have active calls going & they are both driving at least 30 mph. But walking slighting different paths with phones pinging when they want? Differences in time when new cell tower is pinged is not statistically significant indicator of exact location. Yes you could plot cell triangulation of ping strengths for a much better picture of movement but you need 3-6 pings (45-90 minutes). But then good stalker wouldn’t always be behind walking same path. Even bad stalkers often get ahead to lay the ambush. Keep cell towers ping history to roles similar in precision to reading daily planner schedule (only confirmed that your cell actually went there).